Search must be longer than 3 characters. The WA15 is a low-cost, self contained entry level system. Primarily used for pure water applications such as food and rubber, its low price point also makes it attractive for abrasive prototyping applications. Proven, heavy-duty, industrial, high-pressure intensifier. Slow intensifier speed – 15 cycles/minute. This slow speed both reduces the number of pressure spikes in the system and reduces the number of pressure reversals. This slow speed virtually doubles the fatigue life as compared to other waterjet pumps. One large accumulator insures low pulsations in the high-pressure system. All high-pressure tubing and fittings are Autoclave. – motor starter and overload relay in US models. Highly reliable proximity switches control the sequencing of the intensifier. 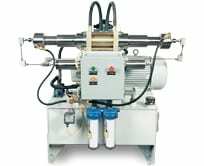 Low hydraulic oil pressure – 2500 psi / 172 bars. A dial compensator allows for simple control of the cutting water pressure. WSI manufactures its own waterjet parts, some of which are compatible with KMT Waterjet Systems Inc., Flow Waterjet, and H2O Jet products. WSI and its products are not affiliated with KMT Waterjet Systems Inc., Flow Waterjet, or H2O Jet. Corporate names, trademarks, and part numbers are for reference only. KMT Waterjet Systems Inc., Flow Waterjet, and H2O Jet are registered trademarks of Shape Technologies Group.